Some information is Preliminary and subject to change. can be found here (same site, top page). The Little League® Intermediate World Series is the most exciting of the 7 World Series to watch. It will be held at Max Baer Park in Livermore California from July 28 to August 4, 2019. This is the seventh year of the Intermediate World Series. In 2019 the Intermediate World Series features 6 US teams (one District 57 and 5 regional champions) and 6 International regional champion teams. Starting in 2018, Puerto Rico and Mexico will alternate years in having a direct spot in the World Series, with the other country playing in the Latin America pool. 2019 has Mexico with a direct spot. There will be 24 total games played 2019 (including the Challenger game and 2 consolation games). Note: This page is provided by eLivermore.com. See About This Page below. This is NOT the official website for the World Series. Click here for the official website. This IS the official website of the LLIWS photographer. The Intermediate Division consists of ages 11 to 13, but will mostly be 13 year olds. NO player will have turned 14 by the time of the World Series games. The division is also knows as "50/70" as the distance from the pitching rubber to the plate is 50 feet, and the distance between the bases is 70 feet. Rules are very similar to the Jr. 80s Division (which has 80 feet between bases) in that playing off and stealing bases are allowed. This is one of 4 Little League Baseball World Series and 3 Little League Girl's Softball World Series. Note that the more well known Little League® World Series is the "Majors" (up through 12 year olds) world series held in Williamsport, PA in late August. Housed above the MB1 press box. TBD. Best guess: 90s during the day. No Rain. All of the small photos on this webpage can be found here in the "close plays" from 2017 album. Team schedules are dependent on each game's results. A team's next game is not known until the current game completes. See the Bracket below. Teams for picked randomly for the bracket positions on March 27, 2019. Note that a few of the game times might get swapped, team matchups will not change. "photos" links go to my photos of the game. "video" links go to the livestream video of the game. There is no livestream for the final 3 games as they were broadcast by ESPN. All teams play a minimum of 3 games. In some cases the 3rd game is a "Goodwill" game. It is possible for a team to play all 7 days, but it has not happened yet. So far 5 teams have played 6 of the 7 days, with the Host team doing so in 2018. They played all but the 2nd day. No team is scheduled to play more than one game per day. Championship game is at 7:00pm this year. The Home Team is determined by a coin toss prior to the game. No Games on Friday, Aug 2. 23 W21 vs. W22 photo Sun, Aug 4, 7:00pm World Championship. Single Game. All times are PDT (Pacific Daylight time) which is UTC-7. ESPN+ is a subscription streaming service. First Pitch Time and Last Play Time are taken from the timestamp on my photographs, and are not official.. They are extremely accurate, however. Note: The US and International Championship games are single elimination, even though one of the teams enters with 1 loss and other with 0 losses. 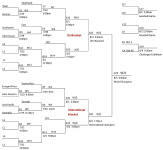 There is NOT an "if necessary" game if the team from the elimination bracket wins. The winner of the Championship games goes on to the finals. 2018 saw only one home run, likely due to the new bat standards. There were 22 home runs in 2017. Links on the player name will take you to a photo gallery for this home run. See this page on the Little League website for the Umpire selection process. Umpires are volunteers. Starting in 2015, they receive a $400 travel stipend to help offset the costs for them to attend the World Series. They stay at the same hotel as the players. There is a Umpire section on the Photos site for the World Series. It is organized per game. I take photos of umpires making calls throughout the world series. These will be posted in the normal photo galleries for each game, then just the photos showing umpires will be copied to the Umpire section. This might occur slightly later, as there are only so many hours in the day. See 2018 Umpire section for reference. See below for more information on the LLIWS umpires. Note that everything written here is my understanding of the rules, and should not be considered official. Distance between bases 70 feet. Home to first: Measured from back of the plate (3rd base line) to the far end of the base. Second base: Measured from the foul lines to the MIDDLE of the base. Home to third: Measured from back of plate (1st base line) to the far end of the base. Distance, Pitchers rubber to the plate 50 feet. 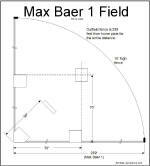 Measured from the front of the pitching rubber to the back (point) of the plate. Distance to outfield fence. 200 feet or greater is "recommended" by the rule book, but it is almost always much further than that unless being played by younger age groups. 13 year olds would hit far too many home runs at 200 feet. Even with the new bats. Max Baer park is 259 feet with a 10 foot high fence. Team sizes Typically 13 or 14 players, but can be fewer. The maximum is 14 players, one manager, and up to 2 coaches. Some international teams will also have an interpreter. Innings played 7. Can be as few as 4 (15 run rule) or 5 (10 run rule). Each game must have a winner, so extra innings are possible. Extra Inning Rule New tournament rule for 2019: Starting in the 9th inning (8th inning for Majors and below), each half inning will start with the last player scheduled to bat that half inning placed on 2nd base. An eligible substitute or special pinch runner may be inserted for the runner. Age Group 11-13 year olds. With the change in the league age cutoff dates starting in 2018 no player will be over 13 during the World Series. Max runs per inning No limit. Leading off, stealing Leading off and stealing are permitted. On Deck Batter On-deck batters are allowed. Generally the on-deck batter stands in a circle behind the current batter (third base side for a right handed batter) as this is the best position to avoid being hit by a foul ball. Minimum Play Tournament substitution rules are different from the regular season rules. There is unlimited substitution (a player may go back in after exiting the game). Tournament play, including the World Series has different substitution rules than the regular season. The sub is "married to" another player. The two of them can be freely swapped, but not with anyone else. The starter may not re-enter the game until the sub has met the required minimum play. Note that the term "married to" is not in the rule book, but is a common method of referring to it. If the team has 13 or 14 players, each player must bat at least once. If the team has 12 or fewer players, each player must play at least 6 consecutive outs in the field, and bat at least once. A substitute may not be removed from the game until he/she has met is mandatory play requirements. A starter MAY be removed before meeting minimum play, but must eventually meet the requirements. The batting rotation is 9 batters. I.E. there is no "continuous batting" order in tournament play. New for 2019: A team which starts the game with only 11 players may only have two coaches on the field. Teams which start with 12 or more players may have 3 coaches on the field. Special Pinch Runner One Special Pinch Runner (SPR) may be used by each team each inning, but only 2 per game. A Special Pinch Runner may run for another player who is on base. A player may have an SPR run for him/her only once per game, but the same player may be an SPR in multiple innings. The special pinch runner must not be in the lineup at the time. A player for whom a special pinch runner is used is not removed from the lineup, and need not have completed his/her mandatory play requirements when he/she is run for. Tournament rules adds the 2 per game limitation that is not in the regular season rules. Note that a player may run for the player for whom he is a substitute (I.E. "married to") without it counting as a Special Pinch Runner. In this case it is simply a substitution. 13 year olds (league age) are limited to 95 pitches. 11-12 year olds (league age) are limited to 85 pitches. If they reach the limit during a batter, they may finish the batter. If a pitcher reaches a specific limit while facing a batter, he/she may finish the batter and still be considered to be within the range. A pitcher removed from the mound may return provided that he/she has played a different defensive position since pitching (was not removed from the game). He/she can return only once. A player who has played as catcher for 4 or more innings may not pitch that day. A pitcher may not pitch in 2 games on the same day. New for 2019: A pitcher may not pitch on three consecutive days under any circumstances. 15 Run Rule If a team is behind by 10 or more runs after they have batted in the 5th inning the game is over. If a team achieves a 10 run lead in the bottom of the 5th or 6th inning, the game is over. If a team achieves a 10 run lead in the top of the 5th, 6th, or 7th inning, the bottom of that inning is played and the game will end at the end of that inning if the lead is still 10 or more runs. New for 2018: 15 run rule (same as 10 run rule, but for a 15 run lead one inning earlier). Note that this rule was used in 2018, but was not in the printed rule book until 2019. The rule was used twice during the 2018 LLIWS. If a team is behind by 15 or more runs after they have batted in the 4th inning the game is over. If a team achieves a 15 run lead in the bottom of the 4th inning, the game is over (in innings after the 4th, the 10 run rule takes affect). If a team achieves a 15 run lead in the top of the 4th inning, the bottom of that inning is played and the game will end at the end of that inning if the lead is still 15 or more runs (in innings after the 4th, the 10 run rule takes affect). Distance from the plate to the outfield fence About 259 feet. The signs on the outfield fence say 255, but is is actually a little farther. It is very consistent to all areas in fair territory. Outfield Fence Height About 10 feet. Fence The field is completely surrounded by a chain link fence about 10 feet high. It is much higher behind the plate (see photo below). Home/Away Dugouts The home dugout is on the 3rd base side. This is the way all fields are used at Granada Little League, and how the scoreboards are set up. The scoreboards on the majors/minors fields look backwards because of this, with the home team on the left side of the scoreboard. The dugouts are not ALWAYS used that way, however. Both the San Francisco Giants and the Oakland Athletics have their home dugouts on the 3rd base side. It is more common for MLB teams to have the home dugout on the 1st base side (18 of 30 teams). Bull Pens Bull pens are down the 1st and 3rd base lines. About the field The field is in Max Baer Park, and is part of the Livermore Area Recreation and Parks District (LARPD). It is used by Granada Little League during the regular season, and is the home field for Livermore Baseball (combined Granada and Livermore Little Leagues) Intermediate team, which is playing in the World Series this year. 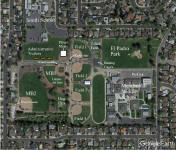 All of Granada Little League's fields are at this location. 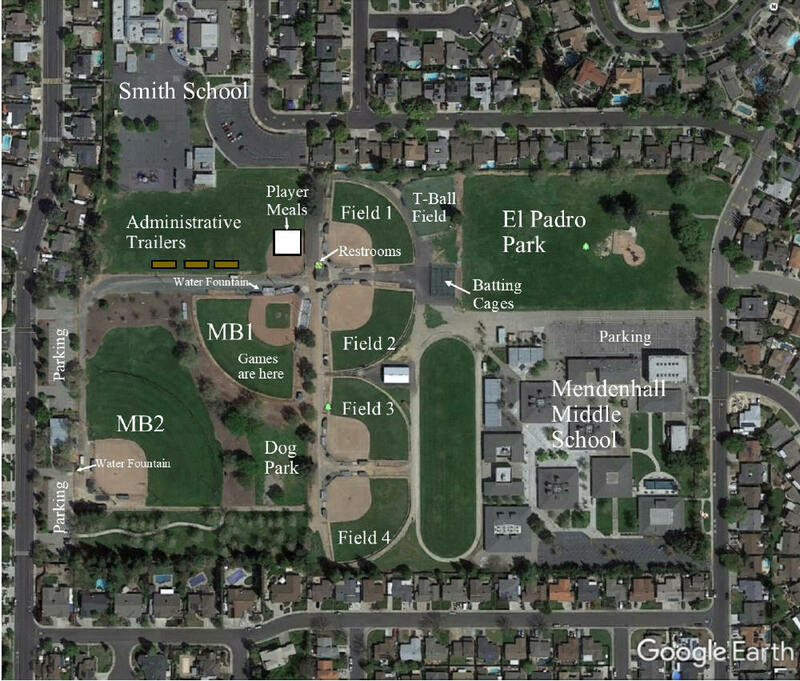 Fields 1-4, used for minors and majors are adjacent, and are on the school district property. Max Baer 1 and Max Baer 2 (90s field SW of MB1) are part of LPRPD. Name of the Park Max Baer Park is named for the boxer Max Baer. Born in 1909, his family moved to Livermore when he was 15. He became the Heavyweight Champion of the World in 1934. His son, Max Baer Jr. is an actor, director, and producer known mainly for playing Jethro Bodine on The Beverly Hillbillies. Max Baer Sr. also did some acting. While in Livermore, he lived in a house that is within the current park, near where the pre-school building is now, by Max Baer 2 field, on Murdell Lane. Dogs Dogs are NOT permitted. However, there is a dog park 60 feet beyond the Left Field fence with a view of the games. Weather Station Visit the Max Baer Park Weather Station, which is on top of the press box. Why the most exciting? The Intermediate World Series is the most exciting of the 7 Little League World Series to watch. It is the first year that the runners can lead off the bases before the pitch, requiring the pitchers to hold them on. At 70 feet between bases, it is far easier to steal than in the Junior or Senior World Series which have 90 feet between bases. Stealing is FAR from automatic, however, at this level of play. Expect to see runners picked off at 1st, and to be thrown out stealing. The oldest players are 13, so the kids are still kids. One year can make quite a difference from the 12 year olds in the Major's World Series, however. They can hit the ball much further. History The Intermediate World Series started in 2013, and has always been played at Max Baer 1 field in Livermore. See "World Series stats and Information by year" for additional information. Team Accommodations The teams stay at a hotel, and are bussed to and from the field. This includes the host team, even though many of them live closer to the field than the hotel is. This provides them with the full experience. Teams will remain for the entire time, even after being eliminated. Teams are encouraged to be at the fields for other's games. 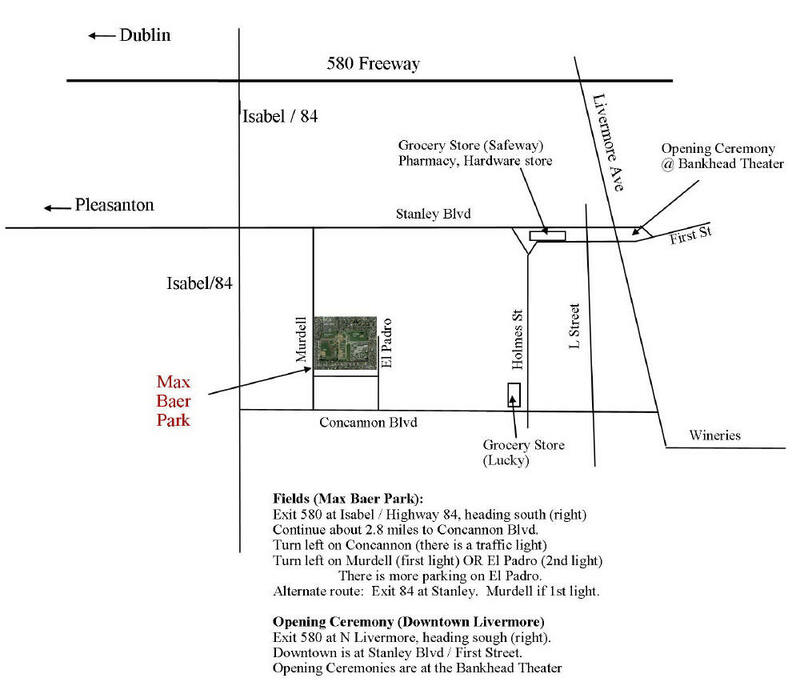 Opening Ceremonies Opening ceremonies will be held in front of the Bankhead Theater on Saturday, July 27 at around 4:00pm. Each team is introduced, and enter from the 1st street area. The first three years featured a parade down 1st Street. Games All games are played on Max Baer 1 field. Four games per day from Sunday through Thursday. Friday is an off day. Teams often do an activity such as attend an A's or Giants game. Saturday has the US and International Championship games, with the finals on Sunday. Tournament basics The tournament is set up very much like the Williamsport Tournament but with 6 teams in each bracket rather than 8. It is a Modified Double Elimination format. There are separate US and International brackets. 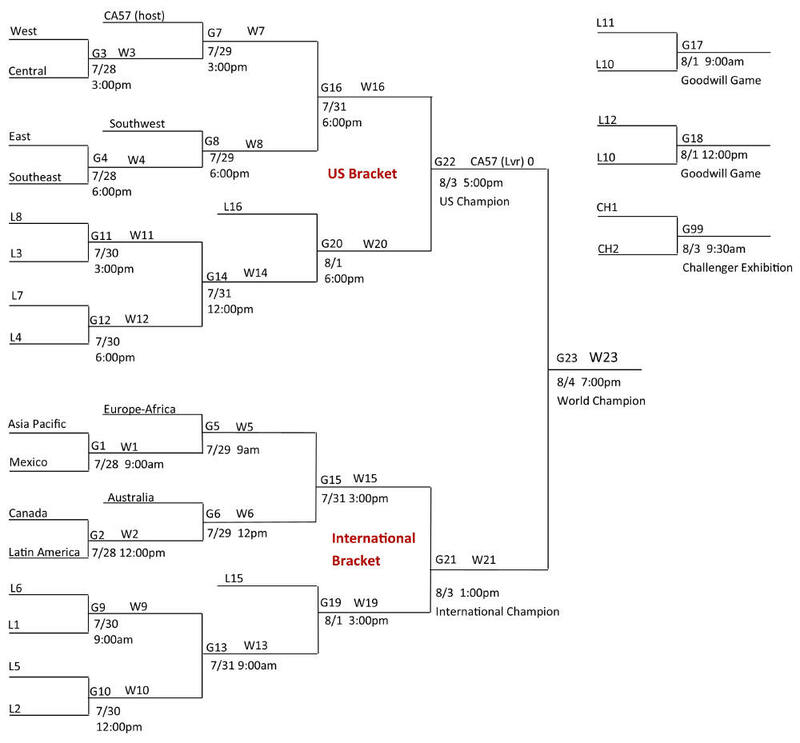 Within the brackets, the tournament is double elimination up to the US and International Championship games. Those championship games will feature one team that is undefeated, and one team with one loss. A single game decides who goes on to the championship game, so it is possible for a team to be eliminated after only one loss. The final game is the World Championship between the US and International champions. This is the only game in competition in which US and International teams play each other. There are two consolation games which have US vs. International teams, but both teams are already eliminated prior to those games. Minimum # of games All teams will play a minimum of 3 games. Some team's 3rd game may be a "Goodwill Game", having already been eliminated. Any team losing their first two games will play a Goodwill Game. Some teams in the Goodwill Game may have already played 3 games. The way the brackets are set up, it is POSSIBLE to have no team lose both of their first two games, but that has never happened. Maximum # of games It is possible for a team to play all 7 days of play. This will happen if a team wins on Sunday, loses their second game on Monday, then wins through to get to the final game. Teams with a Sunday bye could play a maximum of 6 games by losing their first game and winning through to the final game. Prior to 2018, International teams could play a maximum of 6 games (5 in 2013) due to one less team in that group (2 less in 2013). In 2015 one team played 6 games in a row, just barely losing the US championship game which would have had them play all 7 days. The winning team in 2016 played 6 games, after having a bye the first day. Depth of the pitching staff can become very important. Livermore Baseball played 6 games in 2018, losing their first game, then winning 4 straight to get to the World Championship game. No team is scheduled to play more than one game per day. Postponements or suspended games could alter this. There have been no postponed or suspended games in the Intermediate World Series so far. Rain in July/August is EXTREMELY rare, and minimal when it does happen. One game had a small amount of rain following the game. Not enough that it would have stopped the game. In 2018 we had a power outage following the US Championship due to a transformer blowing out (NOT a transformer on the pole by the field). It was still light out so most people did not notice it. Practices, batting cages, and warmups The Saturday before the first games the teams will be practicing on the Granada Little League fields and MB2. No practices take place on MB1 (the World Series field). Teams will be assigned warm-up times and fields, and also batting cage times. There are 4 batting cages. Before each game each team will have a time slot in the batting cages. Each team is also permitted 10 minutes of warm-up time on the game field just prior to the game for infield and outfield practice. In 2017, the Central team did the warm-ups before their 2nd game without using any baseballs. Umpires 14 Little League umpires from around the world will work the World Series. 2018 had 13 umpires. All previous years there had been 12 umpires. There are 6 umpires on the field at all times, with a plate umpire, one at each base, and one down each baseline. The umpires were divided into 2 teams of 6. The two teams alternate games with one doing the odd numbered games and one team doing the even numbered games. The umpires rotated positions, with each having a turn at each position. After 12 games the teams are mixed up to again form 2 teams of 6. Starting in 2018 things were more complicated. No umpire was to be on the field from the region of either team playing. All umpires are generally present at the Challenger game. Prior to 2018, all umpires are generally used in the World Championship game. The plate and base umpires remained constant throughout the game, but the 2 umpires down the base lines were swapped out every few innings. In 2018, however, only 6 umpires were used in the World Championship game. Goodwill Games Two Goodwill games are played. These games assure that every team will play at least 3 games. Both games pair a US team against an International team. These are the ONLY games other than the Championship game to have a US team play an International team. These games are played under the same rules as the competition games, and have the full teams of 6 umpires participating. They will be photographed the same as the other games. Time between Games It normally takes 50 to 60 minutes between games (last play of game until the first pitch of the next game). During this time the field is prepped, new baselines and batters boxes are chalked (by a dedicated volunteer field crew). The next game's teams each get 10 minutes on the field for warm-ups. Before the first pitch, the umpires and players are introduced, and the national anthems are played. It adds up quickly. Note that the first pitch and last play time for each game is recorded above. It is available on the past year's pages back to 2014. These times are taken from the time stamp on my photographs, so while "unofficial" they are extremely accurate. TV Coverage Preliminary: The finals are broadcast on ESPN2. The semi-finals (US and International Championships) are broadcast on ESPN+, which is an online subscription service. All previous games are webcast with small fixed cameras using volunteers. Closing There are no closing ceremonies. The World Champion team will celebrate on the field immediately following the game. Teams leave the day after the championship game unless they have made other arrangements. Teams 6 US and 4 International 6 US and 5 International (Europe-Africa added) 6 US and 5 International 6 US and 5 International 6 US and 5 International 6 US and 6 International (Australia added) 6 US and 6 International. Mexico in alternating spot. Weather Cool, relatively. 88F (31C) was the highest high Hottest so far. 102F (39C) several days. Low humidity. Cool, relatively. 88F (31C) was the highest high 91F (33C) was the hottest, so quite nice. 101F (38C) midweek. Humidity came up on Thursday. Gorgeous (mid 80s) on Saturday and Sunday for Championships. Low 90s (32-33C) most of the week. TV Coverage The Championship game was televised by ESPN2. See photos of the TV production setup. The same equipment was used as is used for Monday Night Football, etc. Announcers: Mark Neely, Chris Burke The Championship game was televised by ESPN2. Announcers: Mark Neely, Eduardo Pérez The Championship game was televised by ESPN2. Announcers: Mark Neely, Dallas Braden The Championship game was televised by ESPN2. Announcers: Mark Neely, Chris Burke US, International Championships televised on ESPN3. Announcers: Mark Neely, Mike Rooney US, International Championships televised on ESPN+. Final Championship Game televised on ESPN2. This was the first time that a remote studio was used. All camera feeds were sent to a studio in Orlando via satellite link. US, International Championships televised on ESPN+. Photos All games were photographed by Bill Nale of eLivermore.com. A single small flagpole installed behind the outfield fence. Yellow plastic pipe put on top of outfield fence. World Series sign installed on the back of the pressbox. New bleachers added on the 3rd base side. "Babe Ruth" mural had been painted on the back wall of the snack shack. Six Flagpoles installed beyond the outfield fence to hold the flags of the 6 countries participating. Prior to this the International flags were on the fences down the 1st and 3rd base lines. Bleachers installed down the 1st base line. Electrical building made smaller. Fence height increased in front of the bleachers. One additional flag pole was added for the additional team (7/21/2018). Opening Ceremonies after the parade at the plaza. Granada HS Cheerleaders participated in the parade and opening. No Parade. 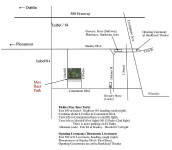 Field games were provided for the players at the fields Saturday 7/30 from 12:00 to 4:00. Opening ceremonies at the fields Saturday 7/30. Began at 4:40. Granada HS Cheerleaders participated in the opening ceremonies. No parade, but there was a team by team entrance to the plaza in front of the Bankhead Theater. Opening ceremonies in front of the Bankhead Theater. July 29, 4:00pm No parade, but there was a team by team entrance to the plaza in front of the Bankhead Theater. Game Days Games played Tuesday to Monday July 30 to Aug 5. Games every day. Games played Tuesday to Monday July 29 to Aug 4. Games every day. Games played Sunday to Saturday Aug 2 to 8. Games every day. Games played Sunday to Sunday July 31 to Aug 7. No games on Friday Games played Sunday to Sunday July 30 to Aug 6. No games on Friday Games played Sunday to Sunday July 29 to Aug 5. No games on Friday. Teams went to an Oakland A's game on Friday evening. Games played Sunday to Sunday July 28 to Aug 4. No games on Friday. in a full 7 inning game. Seating There are bleachers for about 900 people. Attendance varies based on the game, but the Championship game had about 6650 people attending. Bring lawn chairs or blankets for viewing from the outfield. Outfield viewing has a casual festive atmosphere. It is where I took most of my photos from in 2013, and provides excellent viewing. The outfield area in dead center field is blocked off so that the batter and catcher have a neutral background and are not distracted. Activities Besides watching great baseball, there are other things to do. The outfield area of Max Baer 2 often has a lot of people casually watching the game, playing Frisbee, etc. There are also youth gathering on fields 1 and 2, hitting the ball around. Often players from World Series teams are joining in. Restrooms Restrooms are located in the Snack Shack building (green cinder block building with the mural painted on it). Entrances are on the North side. One on the left side of the 1st base dugout of MB1, by the bleachers. Near the pin booth. One by Max Baer 2 field, on the 3rd base side (by the preschool building). This one is much further away. Food There will be several food vendors plus the Granada Little League Snack Shack serving a variety of food. The selections vary each year. Weather Rain is HIGHLY UNLIKELY. Rain is very rare in Livermore in the summer. The rainy season is in the winter. It doesn't rain in California. In the summer. Temperature: Highs are generally in the mid 80s to high 90s, and sometimes over 100F. Lows are generally in the high 50s to low 60s. Weather in 2018 was in the low 90s at the highest. Beautiful Baseball weather for many games. For the evening games, it will cool off considerably by the end of the game. A jacket is recommended for the later parts of the evening games. Humidity: low. It's great. OK, the humidity was up near the end of the week in 2017. Not Florida high, but higher than normal for here. The hills that surround Livermore will be golden brown. They get that way every year. Hence the "Golden State". Photography Photography can be done through the outfield fence with good results. I took most of my photos from there in 2013 (see photos of the 2013 finals here). There is a standard chain link fence all the way around the field, which can be a little challenging for photographing, but I had pretty good results in 2013. Official Photography In 2019 I am once again the official photographer. My photos of every game will be available for viewing and downloading on this website. The full resolution photos may be downloaded at no charge. Prints may be purchased at my cost (what is charged by the photo sharing service I use). You may also have prints made from downloaded images at your favorite photo printing service. I am a volunteer, like so many others at this event. Lawn Chairs and Blankets to sit on. Cameras (Still and video). You may NOT broadcast or webcast audio or video without proper consent of Little League Baseball, however. Sunscreen. There are some shady areas for fans, but not all of the fan areas are in the shade. Dogs are NOT permitted. However, there is a dog park 60 feet beyond the Left Field fence with a view of the games. Coolers are NOT permitted in the park. Scooters and Bicycles may be used to get to the World Series, but may not be ridden inside the park for safety reasons. Stealing With the 70 foot bases, stealing is easier than in 80s or 90s. However, at the higher levels of play, while common, it does not happen as often as you would think. This is the shortest base distance where stealing is permitted (technically you can steal at younger divisions, but you may not leave the base until the ball reaches the plate). Home Runs Home runs have varied greatly. 2018 saw only 1 home run, mainly due to the new bat standards. Prior to 2018 the minimum number of home runs was 5 in 2013, and the max was 22 in both 2015 and 2017. There is a dent in the yellow plastic pipe on top of the outfield fence from an "almost" home run. See photo here. Foul Balls in the stands Foul balls will definitely go into the stands. Be alert, as you would be at an MLB game. Foul balls do NOT have to be returned to the field. You may keep them. Never grab the fence with your fingers through. Foul tips and foul balls travel at a very high rate at this level. Bill Nale of eLivermore.com is the official photographer of the 2019 Little League Intermediate World Series. I am one of the many volunteers at the World Series. As a volunteer, my photos are provided at no cost. You may download the full resolution photos from the photo site for free. Prints and other items may be purchased form the site, at my cost. I use a site called Zenfolio. Their rates are reasonable. It is likely cheaper and faster to download the photos and have them printed at your favorite location, however. Photos of all games are displayed in albums on eLivermore.com's photo gallery site. Photos from all previous years are still on the site. You may use the photos for your own personal use, including on social media. Teams may use the photos on their team websites, etc. I take photos at all of the games, and of events around the fields. I will also get photos of each team under the scoreboard. Click on the "Download" selection above the photo. Chose to download just this photo or all photos within the gallery. If you choose to download the entire gallery, it will be provided in a ZIP file. A Gallery can be quite a large file. Go to a Gallery of photos or an individual photo. Click on "Buy" on the upper right side of the page. Follow the instructions on purchasing. Feel free to have prints made elsewhere by downloading the photos. This may be quicker and cheaper. This web page is produced by Bill Nale, the game photographer for the Little League Intermediate World Series, as part of my eLivermore.com website. The purpose of this page is to provide detailed information about the LLIWS, much of which is not provided elsewhere. My philosophy for the page is "If I were attending the World Series as a parent of a player or as someone living locally, what information would I want to know." As an Silicon Valley engineer, I am interested in the details. I have been told numerous times by people that they look for this kind of information at tournaments, and that this is the only tournament, on this page, where they have found it. The information provided here is unofficial, but it is gathered from multiple sources such as the Little League Rule Book and multiple Little League online sites. Some information, such as the start and end times of games are taken from my photos, photo time stamps, and other personal observations. There are now 7 World Series associated with Little League® Baseball. Note that the Big League Baseball and Softball World Series have been discontinued as of 2017. Intermediate (50/70) Baseball July 28 - Aug 4 Livermore, CA 70 foot bases, 11-13 year olds. 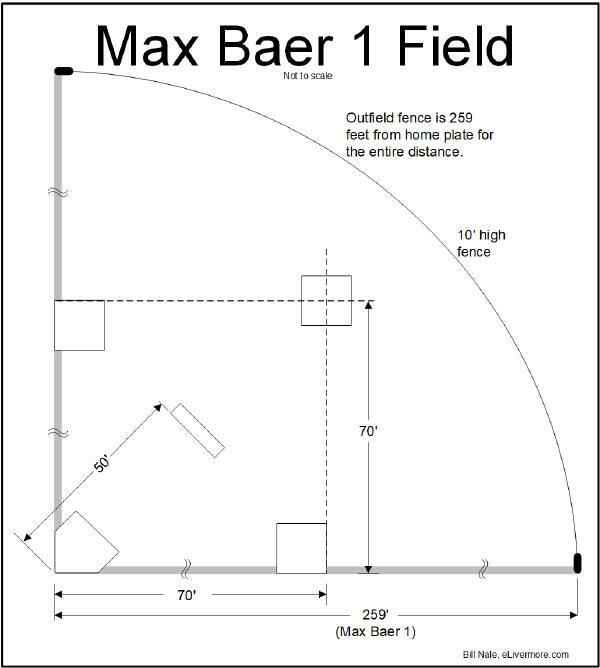 Max Baer fence is at 260 feet. Playing off is permitted. Junior League Baseball Aug 11 - 18 Taylor Mich. 90 foot bases (like MLB) 13 to 14 year olds. Playing off is permitted. Senior League Baseball July 27 - Aug 3 Easley SC. 90 foot bases (like MLB) 13 to 16 year olds. Playing off is permitted. Little League Softball Aug 7 - 14 Portland Oregon 10-12 year old girls. 60 foot bases. 200 foot outfield fence. Junior League Softball July 28 - Aug 3 Kirkland Wash 12-14 year old girls. 60 foot bases. 200 foot outfield fence. Senior League Softball July 29 - Aug 4 Lower Sussex, Del 13-16 year old girls. 60 foot bases. 200 foot outfield fence. First game on the upgraded field in 2013. Granada has the bases loaded.